Consumption is a key driver of greenhouse gas (GHG) emissions, but it is often overlooked in climate action planning. This guidebook, written by the Stockholm Environment Institute provides advice for local governments seeking to measure and manage their carbon footprint using consumption-based emissions inventories (CBEIs). This guidance outlines a number of different factors that need to be considered to translate a CBEI into a priority list of categories and mitigation behaviors. 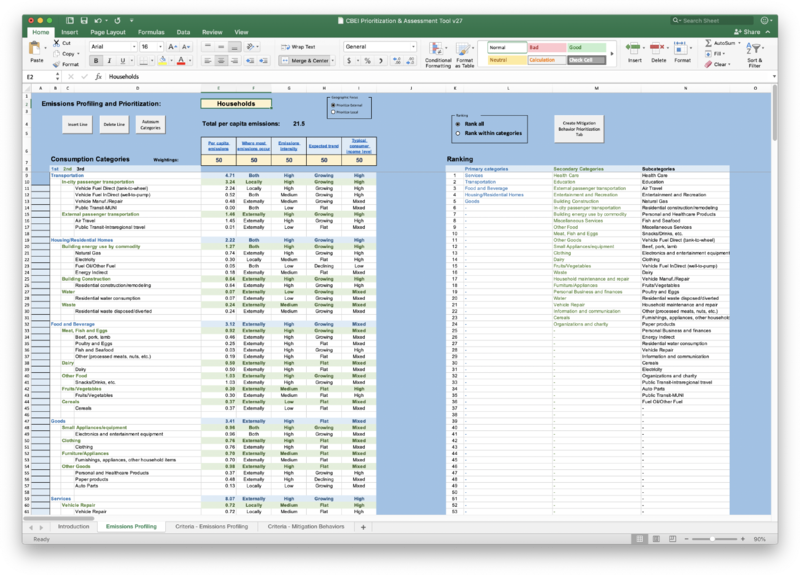 If cities are seeking a structured way to think about these elements, we suggest using this spreadsheet tool to translate your CBEI into a list of prioritized mitigation behaviors. Leading cities have been exploring their carbon footprint using consumption based emissions inventories. These inventories differ from the territorial (or “sector-based”) approach typically used to calculate urban greenhouse gas (GHG) emissions, because they include emissions generated outside city borders to produce goods and services for urban residents. These upstream emissions can be significant—often proportionate to the amount of emissions created within the city itself. CBEIs provide a means for cities to calculate these upstream emissions, and provide insights into the types of consumption that, if reduced, would make the biggest contribution to climate change mitigation. While CBEIs provide important information about sources of consumption related emissions, they are an insufficient roadmap for policy action. This is because, at a city level, a number of additional factors need to be considered when translating CBEI’s into a set of policy levers to reduce emissions. This guidebook is designed to help local governments navigate the options for measuring and reducing emissions through consumption-focused inventories and policies. This guidebook was written by Derik Broekhoff, Peter Erickson, and Georgia Piggot of the Stockholm Environment Institute, with support from Babe O’Sullivan and the Carbon Neutral Cities Alliance. This work benefitted from the valuable feedback from the Oregon Department of Environmental Quality, C40, ICLEI, Good Company, and the cities of Portland, San Francisco, Vancouver, Fort Collins, Iowa City, Stockholm, and Toronto. In conjunction with this online guidebook, SEI has also prepared a guide to estimating consumption-based greenhouse gas emissions at the city scale, which provides a more detailed treatment of the ideas in the CBEI basics and Estimating emissions sections of this website. C40Cities (2018). Consumption-Based GHG Emissions of C40 Cities.